In February 2013, the Mayor of London, Boris Johnson unveiled ambitious plans to create a 'floating village' as part of his on-going drive to transform London's Royal Docks. In July 2014, the plans moved a step closer when consortium, Carillion Igloo Genesis, won the competition to design and build 'the village'. 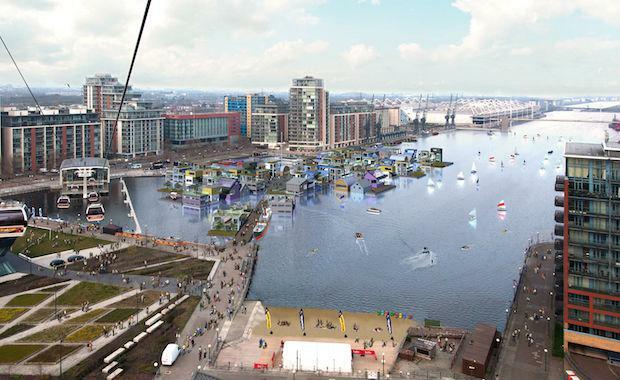 Carillion Igloo Genesis were selected to transform the 15 acres of water at the Royal Victoria Dock site, sitting directly to the east of the Emirates Airline, transforming it into a thriving community with floating homes, restaurants, cafes and bars. Carillion, Igloo Regeneration Fund and Genesis Housing Association. Although a first for the UK, floating developments are already a popular idea on the continent with successful schemes at Ijburg near Amsterdam and Hafen City in Hamburg as well as many others throughout Scandinavia. dRMM, led by Professor Alex de Rijke, who recently presented his studies on floating villages to the prestigious Venice architecture biennale. The winning consortium’s scheme includes a custom build approach for each of the 50 residential homes, enabling prospective occupiers to be part of the design-process of their homes, and a blue water square, framed by a market square and a floating corniche. There will also be a large multi-purpose events space and a mix of non-residential uses including restaurants, cafes, shops and leisure and office space. Plans for additional facilities, such as a floating Lido and an ice rink, were also proposed as part of the bid. The scheme takes inspiration from the tried and tested floating homes at Ijberg near Amsterdam and have been assisted by Dutch floating structures experts Mark van Ommen of Floatbase and Ton van Namen of Monteflore, who have already delivered exemplar schemes of over 300 floating structures. Carillion Igloo Genesis’ submission is 100 per cent floating with the walkways, residential and non-residential units anchored in place using a series of piles located within the dock and connected to the dock by bridges. The floating water-homes will use the same concrete foundations that are already in use at the Ijburg development in Holland. The construction of the homes including the bases will be carried out off-site and then transported by water to site. The scheme also incorporated a high allocation of affordable housing. “Through Genesis’ involvement in the bid, we’ve been able to secure a higher allocation of affordable housing within this scheme, which chimes closely with our mission to deliver diverse, mixed tenure developments in London and the South East," said John Carleton, Executive Director of Markets and Portfolio at Genesis Housing Association. "Drawing on our expertise in running other high profile London regeneration projects we aim to create a sustainable and thriving community. "The Mayor inherited almost 700 hectares of land as a result of the Localism Act and is currently one of the largest owners of public land in London. He is determined to bring more public land forward for development and accelerate the number of homes being built for Londoners. “This site has the potential to become one of the most sought after addresses in the capital while breathing new life back into London’s waterways," said the Mayor of London Boris Johnson. "Carillion Igloo Genesis’ scheme will create a unique mixed use development providing a range of commercial activities within a high quality water environment for Londoners and visitors, creating jobs and raising the profile of London’s Royal Docks." Working with the London Borough of Newham, this includes the regeneration of the former Royal Docks area, with recent investments in this area including the opening of the Emirates cable car and the Siemens Crystal Centre, as well as forthcoming developments on GLA owned land at Silvertown Quays and Royal Albert Docks which combined would result in over 8 million square feet Gross External Area of new commercial space. “Living in a floating home you've helped to design is a dream lots of us have," said Chris Brown, director of Carillion Igloo Genesis. A planning application is expected to be submitted in Spring 2015.